iLife - The Cape Academy of Maths, Science & Technology: Centre of Excellence! ... "Praestantia"
The Apple iLife competition was an opportunity to allow learners to take extra-ordinary class projects, interpret the work and report back in the format of a dazzling movie, a sound clip, or even a video podcast posted on their own personal website. All with the help of the amazing iLife suite of programs available on a Mac. 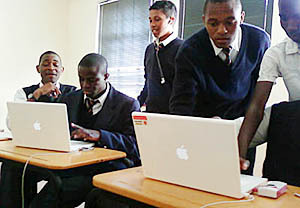 Students live in an ever changing digital environment, and in order for educators to enhance the learning process they need to stimulate learners within the digital medium in which they operate.The iLife software allows learners to internalise their work by creating and presenting their own projects using photos, text, video and audio elements.